The player pilots his ship flies over alien cityscapes, shooting down various ground and air enemies using bullets and missiles. Defeat the bosses with guided missiles at the end of each level. Continuing where Time Pilot left off, Time Pilot ’84 is set only over futurstic fantastic alien cityscapes. Each level features unique ships, including metallic vehicles that cannot be shot by bullets but must be shot with a guided missile after acquiring lock-on. 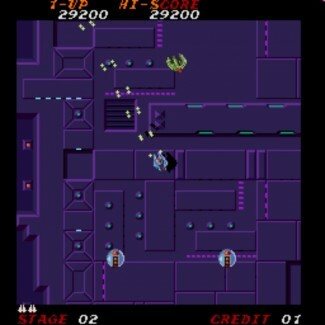 Each level ends with the same boss, a large saucer that shoots guided missiles. This boss appears after destroying a certain unknown number of enemies. There are several hidden targets to shoot and hidden static ground targets will appear when locked-on. The biplane and formations of the player’s ship from Time Pilot occasionally appear. Shoot any formation of like ships for bonus points. Destroying the biplane from Time Pilot which occasionally appears will earn you an extra life.